The site was very near what had been the Nuestra Se�ora de la Pur�sima Concepci�n de Maria Mission. 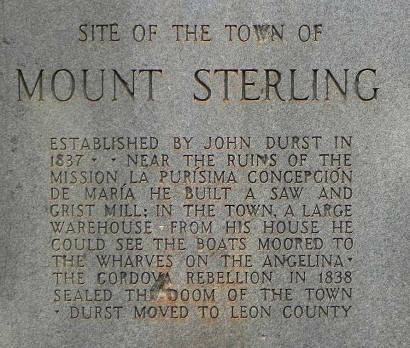 Durst, as entrepreneur, built both a sawmill and gristmill powered by the flow of the Angelina River. He also constructed a toll bridge which connected two segments of the Camino Real (Old Spanish Trail). Besieged by Cherokee Indians, Durst�s substantial house was used as a refuge for settlers on more than one occasion. The settlement had a post office in operation for a brief period, closing in 1840 due to Indian raids. Durst had enough and moved to safer ground in Leon County about this time. The leaving of a town�s founder can dishearten even the most enthusiastic setters and soon the site was left to the Indians, who, finding no settlers to terrify, moved on, themselves. 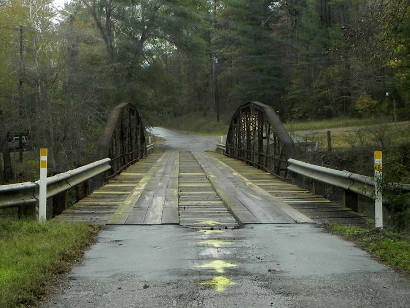 In December 2010, Mount Sterling�s site was found by photographer Barclay Gibson who went in search of the marker and found lagniappe in the form of a beautiful 1929 bridge. Today the name of Goodman�s Crossing is kept alive by a very tidy liquor store (that doesn�t sell ice cream). 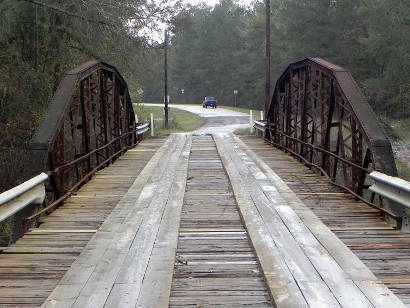 In planning this trip, I made sure to use a back road that would lead me to the Goodman Pony Truss Bridge. 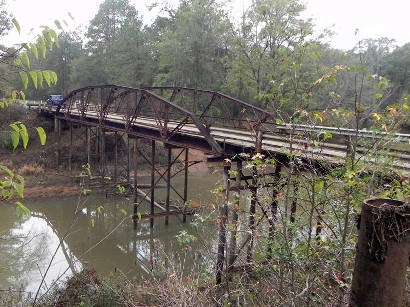 Built in 1929, it was 150 feet across with Wooden Planked Decking over the Angelina River, the county line between Cherokee and Nacogdoches Counties. 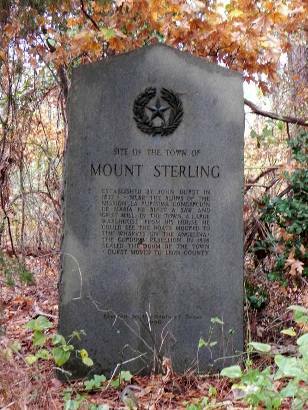 Taking a right, the Mt Sterling marker was supposed to be just up the road. 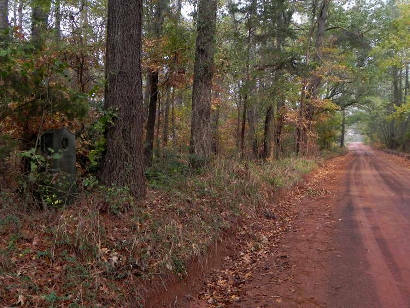 I saw the Goodman Store and thought I'd stop, buy an ice cream bar, and ask if anyone knew the location of the marker. Inside, I didn't see the freezer case and asked if they had ice cream bars. The clerk said, "This is a liquor store and we don't have ice cream bars. Are you lost, Hon?" I don't know for sure that she called me Hon but it would have fit. 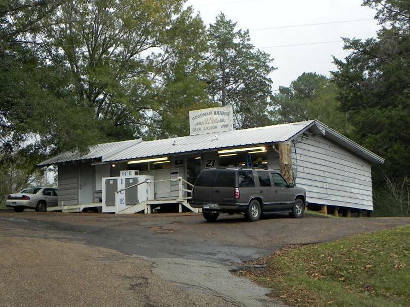 You can see that the photo shows it to be the Goodman LIQUOR Store. I wasn't lost but the question did give me an opening to what I was looking for. 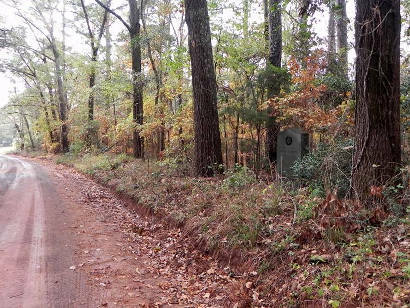 She said that she and her husband used to own the property with the marker, and thought it was about 1/4 mile up the road. It was.